We’d been planning on going to Zorba’s for awhile. My friend C, who is greek, talks about it all the time and about how amazing the calimari is. R was even talking about it awhile back when she went there on a pseudo-date. 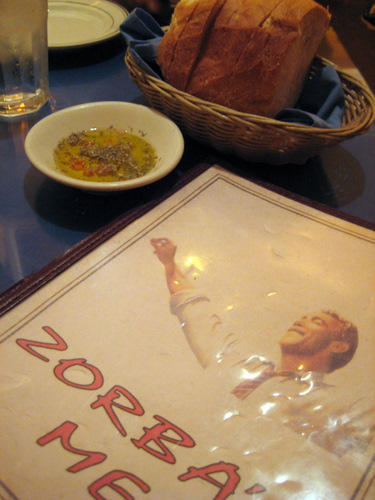 And ever since I’d watched a terrible movie on my last flight, which happened to take place in greece, I wanted to go to Zorba’s even more. It’s a very low-key BYOB in fairmount. On this beautiful evening, there were a few tables set up outside. We chose to sit indoors. As soon as you sit down, you get some complimentary bread with olive oil, vinegar, and dried herbs for dipping. H/A got the lamb shank. 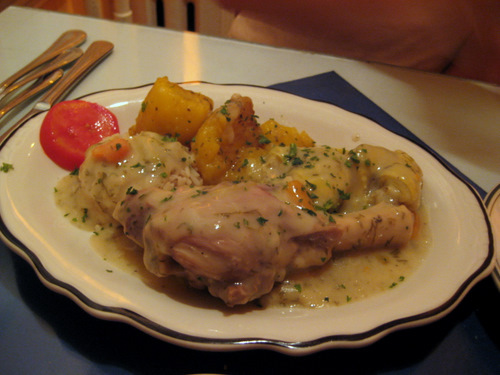 It wasa baby lamb shank cooked in an egg lemon and artichoke sauce, served with rice & potatoes. According to the menu, it is one of the classics of the sunday family table. Neither of us had ever had lamb that came out like this before. I’ve had lamb chops and I’ve had ground lamb that was made into kabobs, but I’d never seen a lamb shank. It’s kind of like a big drumstick. And it kind of tasted like it too! It was very lemony yet creamy. 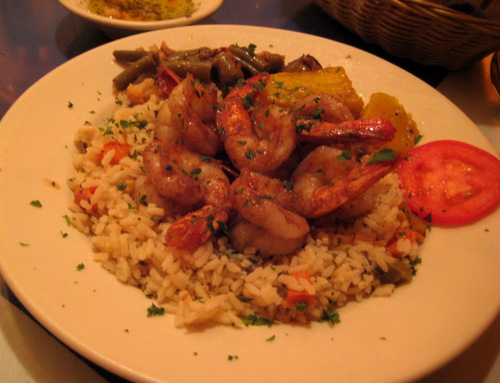 I was feeling the seafood so I got the shrimp santorini, which was shrimp sauteed with garlic, paprika, and red wine, served with rice, roasted potatoes, and mixed veggies. These shrimp were excellent! And so was the rice and veggies. The potatoes were way too salty for me. The food came out really quickly, almost too quickly. But then I figured all of the sides were probably all ready to go, and the lamb was probably also already cooked and probably just needed sauced, and shrimp are super speedy to cook. The service was fine. I think I scared the original waitress slightly at first when I decided to mess with her. But then after she realized I was just kidding, she played along. Something that amused me was that there was a bottle of windex that was constantly being used to clean up the tables. It made me chuckle because of My Big Fat Greek Wedding.